The vacio (pronounced vah-SEE-oh) steak is an extremely popular cut of beef in Argentina -- most often cooked as asado, the general term for an Argentine grill -- and in France, where it is called bavette, often served as steak frites. The vacio steak is also one of the favorite cuts for butchers, due to its size, which is perfect for feeding a large group, and its exceptional tenderness and rich flavor. The cut is one of the flank primal cuts, although it's not really a flank steak. It hangs beneath the loin and is cushioned by the cow's belly, which protects the beef with layers of fat. The vacio usually weighs between four and five pounds and can be cut into individual steaks. However, in Argentina, it is more commonly grilled whole over low, indirect heat. 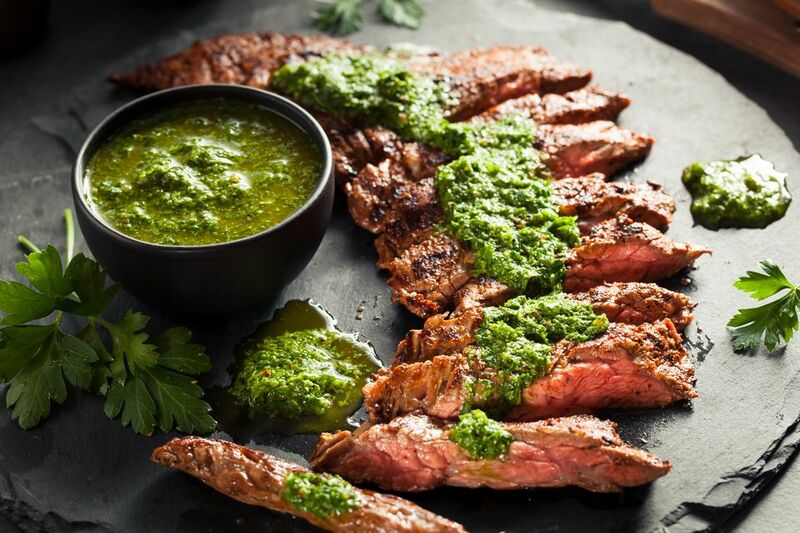 Seasoning is often minimal -- usually just salt -- but the steak is served with either a chimichurri sauce, which is made from parsley, garlic, lemon, and olive oil or salsa criolla, a simple sauce of onion, tomato, and vinegar. Recommended cooking of the vacio steak is starting with an initial sear on all sides on a very hot grill, then either moving the coals to one side or shutting off all but one heating element on an electric or propane grill. Cover the grill, and let the steak cook very slowly, until its internal temperature on an instant-read thermometer reaches 128 to 132 F for medium rare. Let the steak rest 10 minutes, then slice it thinly across the grain. As noted above, the same beef belly-flap cut in France is popular in bistros as bavette steak. There are several variations of bavette steak, but bavette d'loyau is the steak that is identical to vacio. Cooking a bavette steak varies; it can be grilled or pan-sauteed in butter. The steak should be cut into individual steaks and marinated simply in 1 cup olive oil, 1/4 cup red wine, and 1 teaspoon dried thyme, and sometimes, garlic (1 or 2 cloves minced), for at least 8 hours. Finely chop 1 shallot and set aside. Heat a large skillet over high heat, and melt 3 tablespoons unsalted butter plus 1 teaspoon olive oil. Add the steaks to the pan and sauté 1 minute on each side. Lower the heat to medium, season the steaks with Kosher salt and freshly ground pepper, and continue to cook the steaks 6 to 8 minutes. Remove the steaks from the skillet and let them rest on a cutting board. Melt 2 more tablespoons of butter in the skillet, then add the finely chopped shallots. Sauté them 2 minutes until softened and just starting to caramelize. Thinly slice the steaks across the grain and spoon the shallots and butter on top. What Are Some Unfamiliar Cuts That Butchers Love?